Though they ultimately won the game, the Penguins inability to close out the Lightning in regulation belied the fact that they controlled the play in Game 2 of the Eastern Conference Finals. The first 39:50 of Game 3 seemed to be following a similar script, but Phil Kessel and Carl Hagelin were able to combine for a late 2nd period goal, and the Pens poured it on in the 3rd as Pittsburgh beat Tampa Bay 4-2. Kessel and Hagelin each had a goal and an assist, Sidney Crosby and Chris Kunitz rounded out the scoring, and Matt Murray stopped 26 of 28 Lightning shots on goal. The Penguins and Lightning played a scoreless final 40 minutes of regulation in Game 2 before Sidney Crosby scored the game winner 40 seconds into overtime, and they picked up where they left off at the start of Game 3. Tampa Bay would come out flying and took the early advantage in possession, but Pittsburgh would quickly start to reassert their dominance in driving play. The HBK would have a great stretch of play midway through the 1st period where they would generate several quality scoring chances and maintain possession of the puck in the Tampa zone, but somehow they'd be unable to put the puck behind Andrei Vasilevskiy. The Pens would send the Bolts to the power play late in the period when Patric Hornqvist was whistled for slashing Ryan Callahan, but the Pittsburgh penalty kill managed to completely shut down the Lightning power play, and the teams entered the intermission still tied 0-0. The Penguins would continue dominating the play in the 2nd period, and and their presence in the Tampa zone would lead to Ryan Callahan taking a holding penalty against Chris Kunitz after some impressive play by the top line. The Pens wouldn't be able to take advantage of the man advantage, and they'd continue to play 5-on-5 and Pittsburgh would continue to carry play. The Lightning nearly got on the board first midway through the period when Brian Boyle snuck a shot under Murray's arm from the left circle, but the puck rang off the goal post and deflected away into the corner. Vasilevskiy would continue to come up big for the Bolts, turning aside the first 30 shots and almost single-handedly keeping Tampa Bay in the game, but it was the next shot that allowed the Pens to go up 1-0 with 10 seconds remaining in the 2nd. Phil Kessel grabbed the puck and pulled away down the right boards before shooting for a rebound, and Vasilevskiy kicked the puck to Carl Hagelin in the slot, where he was able to slam it past the netminder and in. The teams would come out for the 3rd period each looking for that big next goal, but it would be Phil Kessel to get it when he wristed a Nick Bonino feed past Vasilevskiy to give the Pens the 2-0 lead. However, it would be short lived as Kris Letang lost his man in transition, and Tyler Johnson was able to get in alone on Murray. Johnson was able to convert on the mini-breakaway, and the lead was cut to 2-1 just 14 seconds after the Kessel goal. Midway through the period, Crosby would get away with slew footing Cedric Pacquette in front of the Lightning net, and moments later Johnson would clip Murray in the Pittsburgh zone as the Penguin netminder covered the puck. Letang and Ondrej Palat would get coincidental roughing minors in the ensuing scrum, and the teams would play 4-on-4 for 47 seconds until Braydon Coburn caught Hagelin with a bad elbow up high in the neutral zone, forcing the refs to send him off and give the Pens a 4-on-3. And it would be Crosby who would one-time an Evgeni Malkin feed past Vasilevskiy's glove to restore the two goal lead. It wouldn't take long for them to build on that lead further. Chris Kunitz had a great chance in close that Vasilevskiy was able to get over and stop, but the Lightning goalie quickly found himself scrambling in net, and Kunitz was able to shoot the puck in to make it 4-1 Pens. Coburn would take another stupid penalty later in the game when he high-sticked Rust across the face, giving the Penguins another power play and the ability to kill more time off the clock. The Lightning would score with 1:44 left in the game when Palat one-timed the puck past Murray from the high slot, but it proved to be too little, too late. 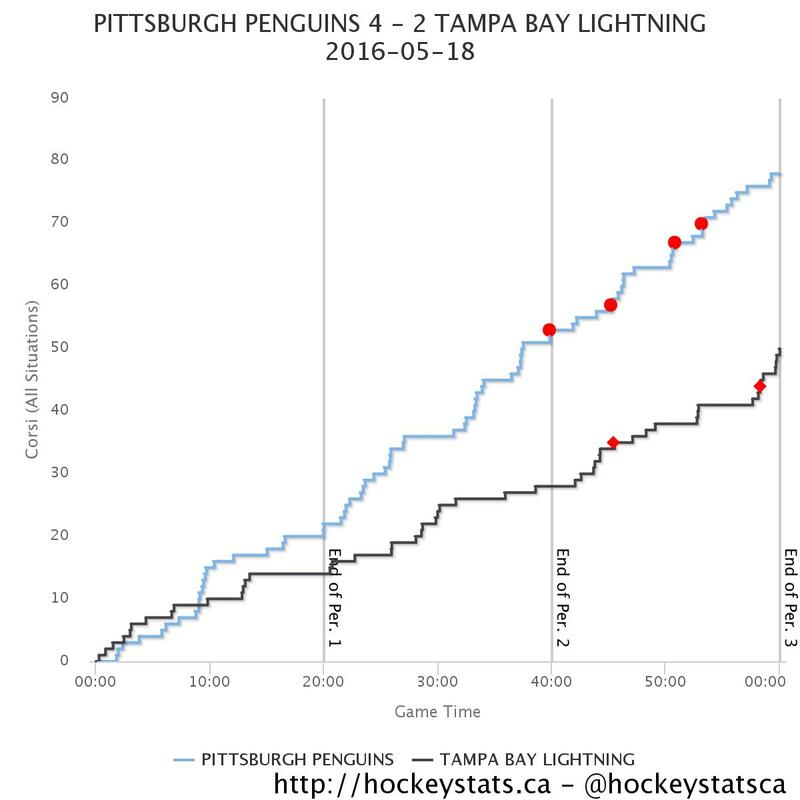 Pittsburgh would thoroughly control the gameplay throughout against Tampa Bay, and it eventually started paying off in the 3rd period. 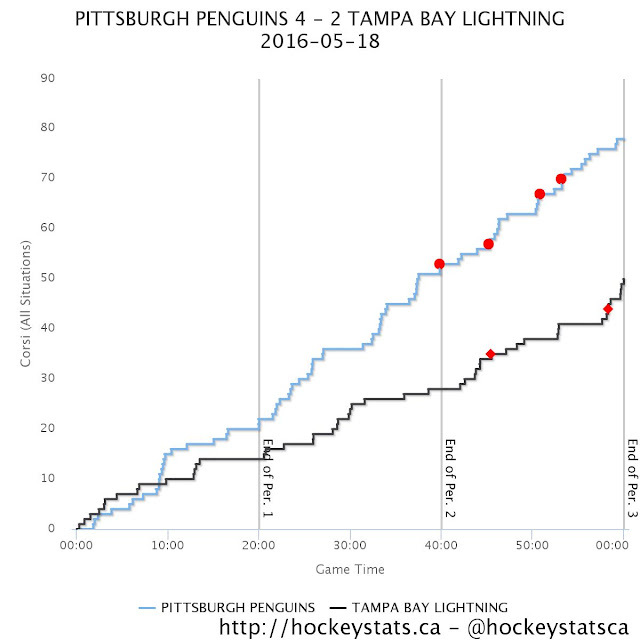 The Pens dominated the Bolts with a 59.8 CF%, and it helped power them a much deserved win. The victory reclaims the home-ice advantage for the Penguins, and they'll look to beat the Lightning on their ice again Friday night. A Game 4 victory would then give the Pens a chance to clinch the Eastern Conference and Prince of Wales Trophy in front of the home crowd at the Consol Energy Center.